Birth or Worth? Or neither? What criteria should open the doors of a temple? The answer seems self-evident to me yet it is still otherwise in practice in some temples in India. Is that not sad? My thoughts today are triggered by the discussion with my readers in my last musical post. The late Jon Higgins, an American, and Yesudas, an Indian Christian are both well known names in the Carnatic Music arena. As Carnatic vocalists they cannot but sing in praise of Hindu Gods all the time. Even otherwise, if their lives’ work is not a worship of Goddess Saraswati then I don’t know what is! Yet both were denied entry to certain temples on account of their not being Hindu. Who could be more deserving? Anyway, if it depended on what we deserved, the halls of temples would be empty indeed! In fact, even Hindus of the lowest-classes used to be denied entry into temples. A terrible thing, this injustice meted out in the name of caste. I have had non-Indians talk to me as if this was true of Indians alone, this class-based injustice. I think not; this kind of injustice is a disease of humankind. Did the people of Israel get just treatment from the ruling Egyptians at the time of Moses? Or the African-Americans get justice in their slavery? What of the Aboriginals in Australia hunted like animals? Or the ethnic cleansing in Serbia in recent history? Oh the shame of it! Such was case of Nandanar who was born in servitude, at the bottom of the caste ladder. He lived around the 5th/6th AD in South India. His caste was such that he was denied even entry to the temples. Yet he was one of the greatest devotees of Lord Shiva. Overcome with the desire to get just a glimpse of his Lord in the temple, he set off once to Thiruppungur. Standing outside the door, he tried to peer in to see the sanctum sanctorum but the great statue of Shiva’s bull, Nandi, blocked his view. It is said that on hearing his plea, the statue moved aside so that he could have a glimpse of the sanctum. 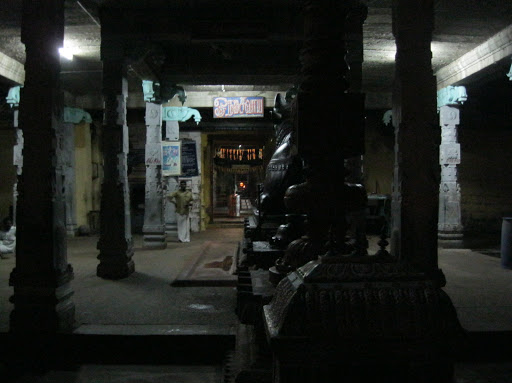 Even now at this temple, Nandi is not in his usual place but a bit aside. This very Nandnar, denied even entry to temples, is now revered as one of the 63 Nayanmar saints whose statues decorate the halls of Shiva temples all over South India. What a come about! One version of Nandanar’s life story was written as an upanyasam (musical discourse) by Gopalakrishna Bharathi (1811-1896). His songs were used in the film Nandanar made in 1942. If you enjoy Carnatic music, this is a recommended watch. In addition to songs by Gopalakrishna Bharathi, we also get to hear songs written by the great poet-composer Papanasam Sivan and Kothamangalam Subbu (1910-1974) of Thillana Mohanambal fame. The wonderful vocalist Dandapani Desikar plays the lead and impressive Serukalathur Sama plays his Brahmin overlord. You can watch a good quality print of this film here (no subtitles). My song choice of today is written by Gopalakrishna Bharathi in his Nandanar Charithram. ‘Alas, my view is blocked by a mountain-like bull which is lying down’ says he. ‘Even after coming to this town, will not this sinner of Parayan caste have his sins pardoned?’ he goes on to ask. He accepts that he cannot enter the temple. ‘It is enough if I can see you from the chariot stop, I will not enter the temple’ he says and begs ‘Will not your bull move just a little?’. For lyrics and translation, see footnote. The song is sung in Raga Todi in the film; I believe Gopalakrishna Bharathi composed it in Todi as well. The version I have chosen for you is presented in Nattakurinji by the melodious and incredibly talented sisters Ranjani & Gayathri. I find the slow and meditative quality of the song very touching indeed. If you would like to know more about the raga, click here. In his next song in Nanadanar Charithram , Gopalakrishna Bharathi has Lord Shiva saying to Nandi – சற்றே விலகி இரும் பிள்ளாய் சந்நிதானம் மறைக்குதாமே ‘Do move a little, my son. It seems you are blocking the view of the sanctum’. And that is what I say to the priests of the temples who deny entry to anyone at all – சற்றே விலகியிரும், சந்நிதானத்தை மறைக்காதீர் ‘Move aside, don’t block the sanctum’. Alas, my view is blocked by a mountain-like bull which is lying down! Even after coming to this town, will not this sinner of Parayan caste have his sins pardoned? Will I not reach your feet? Will I not ascend to your abode, O Lord Shiva? It is enough if I can see you from the chariot stop (note: this is outside the temple gates), I will not enter the temple. It is enough if your bull moves by one foot for me to peer from here today. Will not your bull move just a little?